Ontario postsecondary student leaders say that a government proposal to allow students to opt-out of some student fees is meant to undermine opposition to its polices and will have a negative impact on campus life. Hundreds of students rallied at Queen’s Park on Friday to protest changes to student aid financing introduced by Doug Ford’s Progressive Conservative government this week, among them the student choice initiative. The initiative will give students the right to opt-out of any fees deemed non-essential. Campus-wide services such as athletics or walksafe programs will remain mandatory. Students at most universities pay ancillary fees that range from about $500 to $2,000 annually and contribute to a wide range of services, from campus newspapers to LGBTQ centres, health and dental insurance, as well as student government. 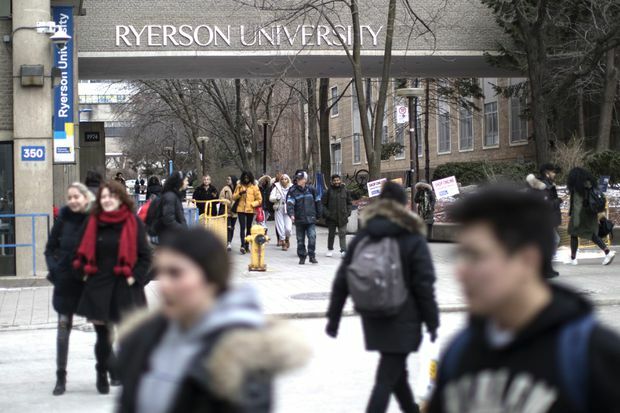 “What is actually being attacked here is democratically elected student unions and resources that we decided we want for ourselves,” Nour Alideeb, Ontario chair of the Canadian Federation of Students, told the assembled protesters. Minister of Training Colleges and Universities Merrilee Fullerton announced a package of changes on Thursday, including a 10-per-cent cut to tuition fees and the rolling back of student-aid changes brought in by the former Liberal government. Ms. Fullerton said the aim of the ancillary-fees policy was to put more money in the pockets of students. Too often, she said, students are forced to pay for services they don’t use and organizations they don’t support. Jack Fisher, president of the Central Student Association at the University of Guelph, said the provincial government’s announcement had stirred anxiety among those involved in campus clubs and student government. For many people, these clubs – whether cultural, sporting, or political – are central to the postsecondary experience. Mr. Fisher said there are approximately 100 accredited groups that receive some funding from the student association at Guelph. He said he doesn’t want to speculate about what may happen to those funds when students have the right to opt-out. Kieran Moloney, president of the Carleton Campus Conservatives, said he was pleased with the minister’s announcement and had proposed something similar to a provincial Progressive Conservative policy convention last fall. He said he was motivated to write the policy proposal by his experience working for the losing side in a recent referendum at Carleton in which students were asked to cut ties with the Canadian Federation of Students. The CFS often takes positions that he disagrees with on issues that he argues are not directly connected to student life. “I realized we weren’t going to see any progress unless we thought bigger,” Mr. Moloney said. The Ontario Undergraduate Student Association (OUSA) said a similar policy was enacted in Australia more than a decade ago, when a conservative government banned the compulsory collection of student fees. The move was eventually reversed, but resulted in lost jobs and reduced services. Danny Chang, president of the OUSA, said he’s concerned that funds directed to student government may be deemed non-essential, but many of the services provided through student government are crucial, he said. He cited the example of a bus pass for students at the University of Western Ontario, which costs only $200, a saving of more than $700 on the regular fee, thanks to a deal negotiated by the students' union. A number of jobs could also be affected. More than 1,600 people are employed in jobs connected to student funds at the eight OUSA member campuses, he added. “We’re worried for students,” Mr. Chang said.